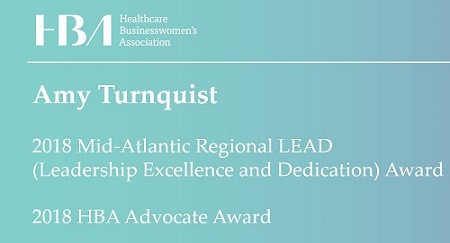 Please join us in recognizing and congratulating Amy Turnquist, our Executive Vice President of Sales, on being named the 2018 recipient of both the HBA Advocate Award and the Mid-Atlantic Regional LEAD Award for her outstanding leadership and dedication to the Healthcare Businesswomen’s Association (HBA). Amy is a passionate advocate for women’s leadership in the workplace – so far in her term as President of the Philadelphia Chapter, Amy has brought significant awareness to HBA’s commitment, frequently speaking out for issues surrounding gender parity and gender pay equity. Among her many contributions to her Philadelphia Chapter, Amy worked with leaders in the healthcare business community to create innovative programs and partnerships that increased membership engagement while working to empower women in our workforce and engage more men in the process. The LEAD (Leadership Excellence and Dedication) Award is the highest honor an HBA volunteer can be given within their region. The LEAD Award recipient is given to the one individual in each region who has demonstrated excellence via sustained contributions at a regional level, positively impacted the region and its ongoing success, and demonstrated dedication to the HBA mission of furthering the advancement and impact of women in healthcare worldwide. The HBA Advocate Award is a new organizational level award which recognizes an individual who has brought awareness not only to the local chapter but to the entire organization through marketing and public relations opportunities and through collaborations with corporate partners. We are very proud of Amy for the exemplary leadership and dedication she bestows to the mission of HBA. The Philadelphia Chapter of HBA was created in 2018 to serve the unmet needs of healthcare businesswomen living and working in Center City Philadelphia. Amy will continue in her role as President of the Philadelphia Chapter in 2019.